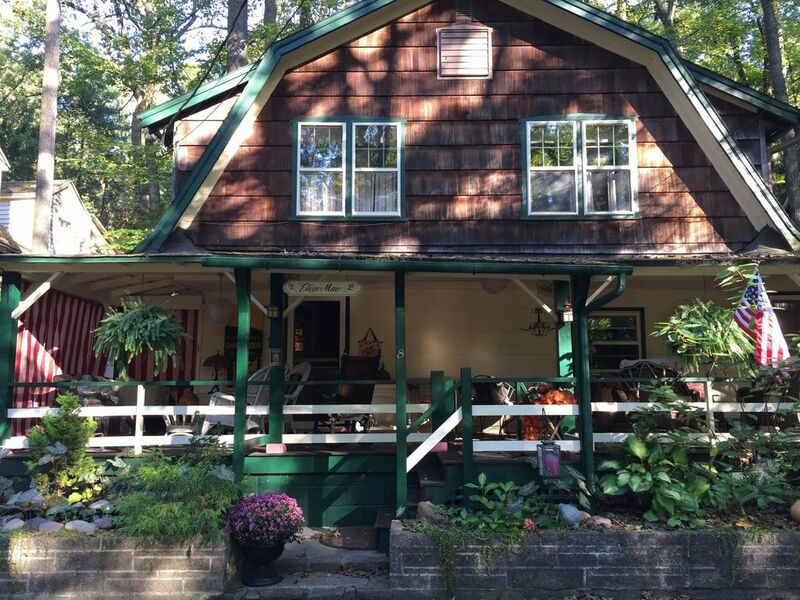 The Eliza Mae Cottage is situated on Muhlenberg Avenue in lovely Mt. Gretna. There is off street parking for several cars including a carport in the rear of the cottage. It is within walking distance to the Playhouse, Jigger Shop, basketball and tennis courts, playground and Rails to Trails walking paths. Go for a swim and relax on the beach or grass area at beautiful Lake Conewago. There is a weekly publication of daily activities in Mt. Gretna , obtainable at walkable stops during your stay. The Eliza Mae Cottage has 4 air conditioned bedrooms and 2 whole house fans. The fully equipped kitchen has a microwave, dishwasher and a breakfast bar. There is a washer and dryer and a clothes line in the back. Along with the kitchen, there is a living room, dining room, sunroom and half bath which complete the first floor. Relax with family and friends on the amazing front porch which has comfortable couches and rocking chairs and a dining table. On the second floor the bedrooms have ample closet space and comfortable mattresses. A king size, queen size, double size and 3 twins make up the 4 bedrooms. Pets are prohibited and smoking is restricted to only the back porch and rear of the cottage. Linens and towels are provided as are all paper products. There is charcoal grill in the back as well as a lovely cottage garden with a bench. The Eliza Mae has modern amenities preserving cottage charm.